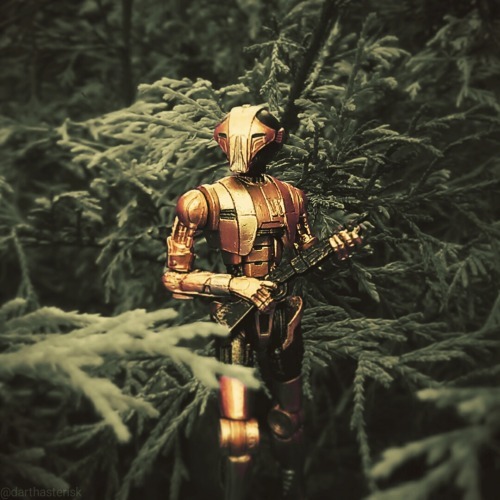 HK-48 was one of the first automatons to be manufactured. While it may lack any human-like features say for being bipedal, it is unquestionably effective at what it does. After being shut down by Serileth, when the time came that 48 was back online, it was employed by a ruthless gang lord. However, one night a man whom 48 presumed was a powerful warrior and utterly decimated the gang. The man even overpowered the leader who at one point fled to the shadows. Upon doing so the man approached HK-48 and issued a hard reset of sorts in an attempt to cut any ties between the automaton and him. Despite HK-48 having been 'set free' once more, it still holds on to its homicidal tendencies and does not hesitate to let them be known. Now this ancient automaton, designed for heavily dangerous assassination missions awaits its new master, with its only defense on why it does this being, "It is a matter of habit." Being utterly made of metal, HK-69 takes 5% less damage from melee attacks, and even returns 2% if the attack is made with an enemies actual body part rather than a weapon. Touch Master, if you dare. While HK-69 now possesses free will, due to preference, if he is instructed to do something by his current master he will receive an additional 5% of gains.